Readergirls is thrilled to introduce author Mary Ting. She has written a totally enthralling novel for young adults entitled Crossroads. Gorgeous angels, mysterious friends, demons, half-angel half-human beings called alkins, a journey for discovery and lots of romance, this novel has so much going for it and the author gives angel lore her own unique spin. We recently finished reading this book and will post our review soon. On the same night of her friend’s tragic death, Claudia Emerson encounters another world, Crossroads, through her dream. There, she learns about a mix breed of angels and humans, who possess supernatural powers. Among those with these powers, lies evil, known as the fallen. 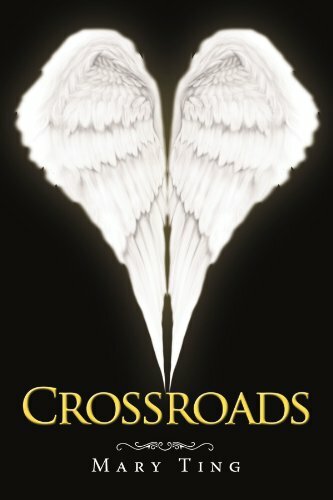 Mystified by her ability to enter this place called Crossroads, certain that the fallen will be after her, she is assigned a guardian angel named Michael. Aden, the fallen leader, is convinced that Claudia holds the key to help destroy Crossroads. Her dream becomes a nightmare as more secrets are revealed, about who she really is, and the true identities of the people she loves most. I started writing Crossroads after my grandmother passed away about 3 years ago. When these characters came to life in my mind, along with the character Gamma, inspired by my grandmother, it was a way for me to heal. I decided to start from a dream I had in high school, chapter one. Chapter two is also based on my dream as well. I didn’t think I would have much to write about, but when I made Claudia to be more like me, it was easy. Her first car, her first job, her first experience at camping and her grandmother having a stroke was all part of me. Too bad Michael wasn’t real…lol!!! Many people like Davin, which I’m really happy about because his character was inspired by my friend who passed away. He was very likable and was a best friend to all his friends. Patty is my friend from church. She is exactly how I described her, social butterfly who knows everything about her friends and fashion. I named Claudia after a student I once had many years ago. I can still picture her face, just like an angel. When I was much younger, I had a crush on a boy name Michael, but his character is based off my husband, protective, romantic, and silly at times. No… he doesn’t have wings…lol!!! Though I was busy with work, being a wife, a mother, and PTA president, I would always find time to write, even if that meant typing while I was cooking or brushing my teeth. Crossroads was written for a fast, fun reading with likable characters. Many have emailed me to let me know how Crossroads has helped them escaped from their everyday stress. Also, how they’ve connected to this book because of chapter one, having a loved one passed away from a drunk driver. I took on a journey not knowing how rewarding it would be for me. I’ve meet so many wonderful people from all over the world through facebook, goodreads and blog sites. I’ve made everlasting friendship where friendship knows no boundaries. And I have to thank my grandmother who continues to watch over me from Heaven. Mary has also graciously offered to give one lucky reader a special prize pack: one paperback copy of Crossroads and a Swarovski heart crystal necklace that is the same shape as the cover of her book. All you need to do is answer this question: Do you believe in angels? One commenter will be randomly chosen. Giveaway ends August 7th at midnight. I do believe in angels. I don't think they go around falling in love with people. They are too busy for that. Hi! this seems a beautiful book. Yes I do believe in a force that can be called angels and protects us, and sometimes can comfort us in a moment os dispair or lack of faith. Actually I do - maybe not in categories such as normal angels, archangels, etc. but yes, I think they do exist! Anyways, I've been wanting to read this for a while! Not angels no but other things like ghosts yes. if this is international please count me in! I don't disbelieve. I know that's not quite the same thing. I want to believe. I don't think i believe in angels but i think it's a beautiful dream to believe in them. It's for that, that i really like to read about them. Yes, I do believe in Angels, but like Stuckinbooks said I don't think they go around falling in love with people. Thanks for the Giveaway! Most definitely! Angels exist whether we admit it or not :) They don't necessarily have to have wings.... angels come in all shapes and sizes. We just have to be humble enough to recognize them. Thanks so much for this giveaway, please count me in! Angles..oh yes i beileve in them for sure...all my life..
Oh, I'm one of them. No I don't believe in Angels. But I believe in the force or power where people have inside them. That in difficult times some of them will do the right and they will help the others without any return. I believe in Angels- I think they look out for us! Previously I would have answered 'no' to this question (vampires = yes, angels = no), but having fallen madly in love with Castiel from "Supernatural" lately, my answer is now 'yes'. Oh, and if anyone sees Cas around, send him my way! I do believe in angels. I know my guardian angel watches over me everyday. I do believe in angels. I think they are all around. No, I don't believe in angels. Wish they really existed, though. I believe in Angels. I'm not sure they are the same way that they are portrayed in books, but they are around! Thanks for the giveaway, that necklace is gorgeous! Of course I believe in Angels, doesn't everyone. Wow, what a great assortment of answers! Thanks for answering and entering everyone. Yes, I do believe in angels. They come in the form of kind people, who are willing to help those in need.